1.Create a warm and romantic atmosphere with 10 warm white LED lights. 2.Cordless battery operated, safe and convenient with ON and OFF switch on the back. 3.LED bulb produces no heat after long-time use. 4.Free standing or be mounted on the wall. 5.A great light and decor for bedroom, study, baby room, etc. It is also a perfect Christmas gift / birthday gift / anniversary gift for children or your friends. 1.Store the light in a cool and dry place and remove batteries if product is not to be used for a long time. 3. If wall-mounted,please ensure it is easy to operate on the switch. 1 month hassle free return, 24h high effecient customer service. If you have any questions,welcome contact us first.Thanks! Made of wood.Cute shape children night lights,cute and adorable appearance.Best for children,kids,baby. PORTABLE:Cordless battery operated, safe and convenient with ON and OFF switch on the back. 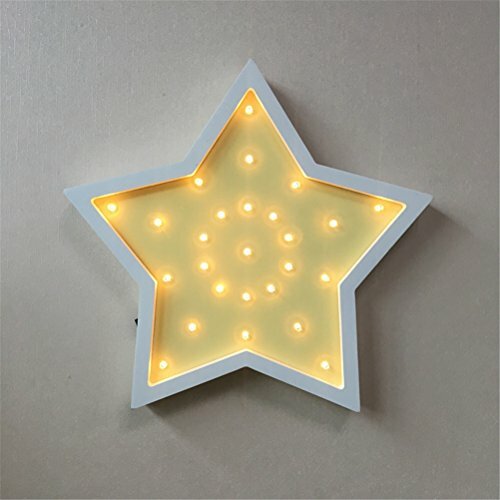 CREATIVE ART DECO LIGHTING:Can be displayed as a standalone or combined with other pieces to create an eclectic lighting installation.Free standing or be mounted on the wall. WIDE USAGE:Great for home decor accents,children's room decor,Christmas decor,nursery decor,gifts giving and much more!